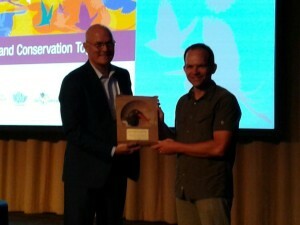 Scott Johnston, left, presents Shiloh Shulte of the American Oystercatcher Working Group the Conservation Leadership Award. Scott Johnston with the US Fish and Wildlife Service, Division of Migratory Birds, Northeast Region, presented the American Oystercatcher Working Group with the Conservation Leadership Award at the North American Ornithological Conference, August, 2016. The group was honored for their unprecedented work to develop and implement the first Conservation Business Plan for the American Oystercatcher. The innovative efforts of the collective partnership, which includes state fish and wildlife agencies, Manomet Center for Conservation Sciences, U.S. Fish and Wildlife Refuge Program, national and state Chapters of the Audubon society, many universities and NGOs, have turned around the population status of this iconic shorebird. The substantial commitment of funds and dedicated support of the National Fish and Wildlife Foundation and all the partners that provide match for projects have also contributed to the significant accomplishments of the working group. Shiloh Shulte of Manomet Center for Conservation Science and AMOY Working Group Coordinator accepted the award on behalf of the working group. Congratulations to all the conservation partners involved in this effort!